After almost 21 years since that our green hero Jazz Jackrabbit has saved the ring from Devan’s dirty hands (Yes, I am totally rejecting the GBA storyline here). Jazz has finally started a new business. He’s now into speedy distribution and mega services in Pennsylvania USA…. well at least according to @RerezTV (Shane Luis)‘s tweet. Not that we can find any information about this. 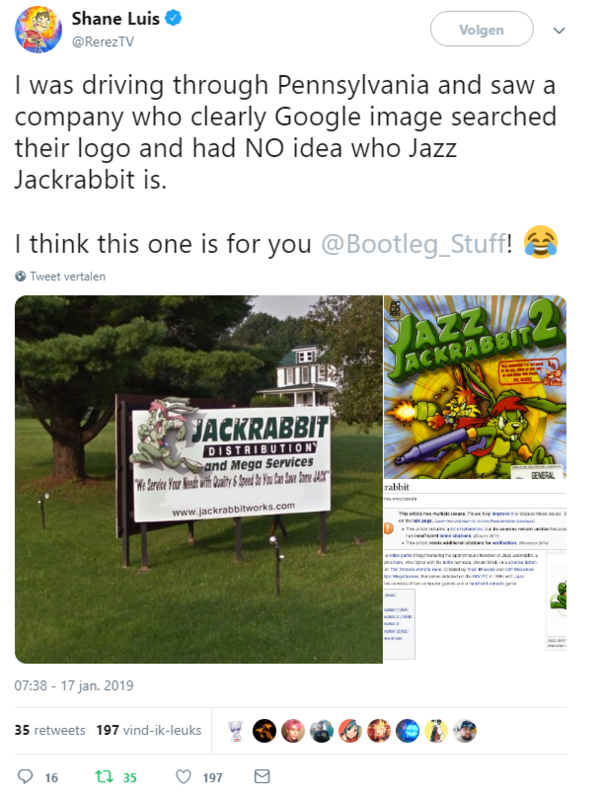 The website jackrabbitworks.com doesn’t work and Google doesn’t give any result. But still funny non-the-less…. Poor Photoshop, but it’s nice that the game still gets a mention every now and then. I believe you’re mistaken. The picture was edited, yes, but only to erase a phone number from an otherwise unaltered photograph, between the slogan and the website. You can see some clear indication of tinkering there, yet nothing else shows any signs of photo manipulation. It is a legit advertising sign.